This trio of pigs come in a light, flowery, Fresh Linen scent. These pristine soap figurines will keep any big, bad wolf from tracking dirty paw prints around your house. Perfect as bathroom hand soaps, the one-ounce piglets in this set are detailed from their curly tails to their cute snouts, and come in a light, flowery Fresh Linen scent. 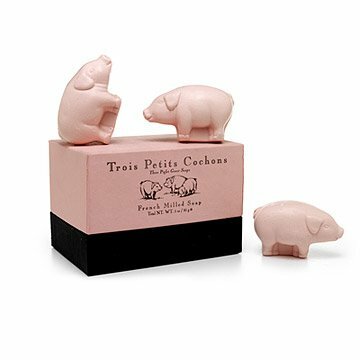 The French-milled vegetable based soap trio, "Trois Petite Cochons," comes in a handsome rose and black box perfect for giving as a gift. Sold as a set of three piglets. Made in the U.S.A. Ingredients: Sodium Palmate, Sodium Cocoate or Sodium Palm Kernelate, Water, Perfume (Hexyl Cinnamicaldehyde, d-Limonene, Linalool), Glycerin, Sodium Chloride, Tetrasodium Etidronate, Pentasodium Pentetate, Trisodium Hedta, CI 177891, CI 177491. Fun gift for the farmer! The huge smile on my friend's face said it all. Perfect gift. Adorable piglet soaps and function well cleaning hands. This adorable soap will look perfect in my mother-in-laws piglet themed bathroom. The packaging was almost too beautiful to open. Perfect little gift for a piggy loving girl. Great smell, cute packaging, and I'm glad there's 3 of them because they aren't very big. Product delivered right on time. Daughter-in-law delighted with gift. Gentle smell, which she loved. Purchased as part of a new-baby gift basket for someone who likes pigs. They're adorable, smell great, and the classy packaging adds to the giftiness. I'm really happy about these, and the new mom will like them too!